We provide alternative entry pathways into UWA for Indigenous students. Apply to attend one of our Uni Entry Workshops in Crawley or Albany and we will set you on the path to success! Want to study or change careers? 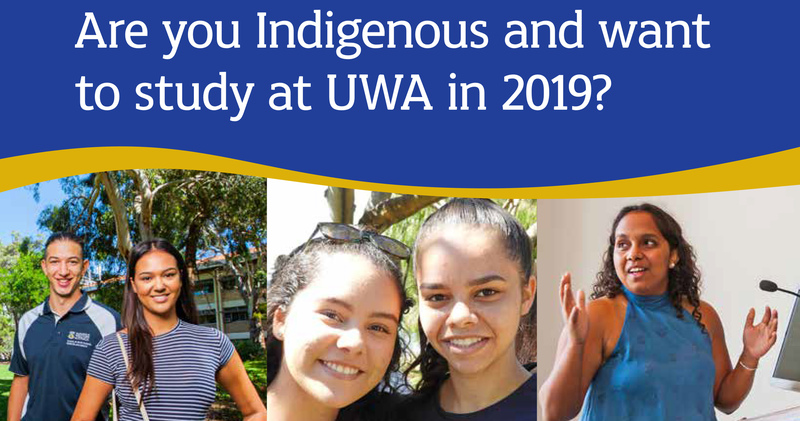 The School of Indigenous Studies provides a wide range of well-resourced services to all Indigenous students at the University, including tutoring, academic guidance and pastoral care. Facilities include dedicated computer labs, study areas, kitchen and spaces to relax and unwind. We are the hub of a vibrant and high-achieving Indigenous community and are very proud of our students. Our alternative entry pathways have successfully launched the university careers of a wide range of word-class Indigenous scholars and professionals. If you do not meet the required ATAR for direct entry into your chosen degree, you may be eligible to take up a degree place through the Provisional Entry Scheme. This pathway is best for applicants who have an ATAR of 70-79, or are mature age and have a strong educational/ employment background. For students who need preparation for university level studies, we offer the the Aboriginal Orientation Course. This is a fee-free course which is normally completed over an academic year. Students who attain the required results in the Course will be offered a place in their desired degree programme. There are no formal education requirements for entry into the Orientation Course. Indigenous students who wish to study at the Albany Centre are eligible to apply for the UWA Smart Start Course. This course is delivered by the School of Indigenous Studies and is based on the Aboriginal Orientation Course. To apply now, please compete the online application or download the form from this page. We will then arrange for you to attend a Uni Entry Workshop. Don't worry if you are not sure which pathway suits you best - simply apply to attend one of our Uni Entry Workshops and we will advise you. Regional students - please get your application in early so we may best assist you with travel and accommodation to attend a Uni Entry Workshop. Our Uni Entry Workshops seek to answer all your questions about studying at UWA and provide you with an insight as to why UWA is such a great choice. We will also run assessments and interviews so we can advise you on your best pathway to a UWA degree. You can download sample test materials if you wish. Please apply to attend the location that is best for you regardless of the entry pathway you are interested in.